Cladding is being removed from residential high-rises across the UK following concerns over fire safety in the wake of the Grenfell Tower tragedy. The government has ordered tests on up to 600 high-rise buildings to establish whether they have been clad in the same aluminium composite material used at Grenfell Tower, as last week's disaster continues to send shockwaves through the UK construction industry. The Reynobond PE cladding used at Grenfell Tower is believed to have contributed to the spread of fire at the London block, in which 79 people are thought to have died. So far, eleven residential towers have been found to be using panelling with a similarly combustible polyethylene core. Police are considering manslaughter charges in relation to the tragedy, after it emerged that the cladding failed fire safety tests. Questions are also being asked about whether the law was broken in the use of the cladding on the 24-storey building. The cladding was added to the 1970s building during renovation works by Studio E Architects and contractors Rydon, which completed last summer. The product was allegedly added to improve the appearance of the building. Fire-retardant cladding was originally stipulated in early consultation documents submitted as part of a planning application for the works in 2012, but cheaper and more flammable Reynobond PE panelling was used. Cladding is now been stripped from buildings in Manchester, London and Portsmouth as a precaution. Panels are being removed from Horatia House and Leamington House in Portsmouth, and from a tower block at Wythenshawe in Manchester. The cladding on a further 56 towers in Manchester is being urgently tested. In London, Braithwaite House in Islington is being stripped of cladding, and Camden Council announced it is removing panels from five towers at the Chalcot Estate near Regents Park, which were renovated by architecture practice HTA and contractor Rydon in a £150 million project in 2010. The panels used to reclad the 1960s towers were supplied by Harley Facades, the same supplier that Rydon used for the cladding of Grenfell Tower. Camden Council leader Georgia Gould said that while the design of the cladding used at Chalcot significantly differs from Grenfell Tower – its fire-resistant rock wool insulation had contained a fire in the estate's Taplow block in 2012 – it will be taken down. "The panels that were fitted were not to the standard that we had commissioned," said Gould in a statement. "The external cladding panels did not satisfy our independent laboratory testing or the high standards we set for contractors." The council is now seeking legal advice against Rydon. 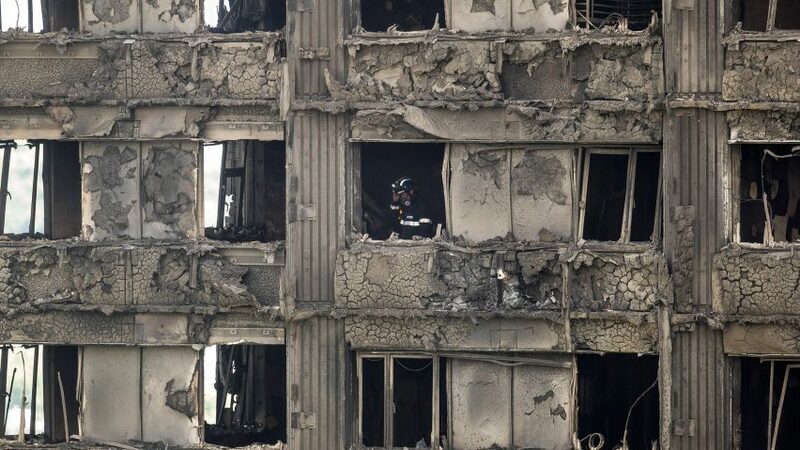 The managers of similar high-rise schemes are currently PAT testing residents' electrical equipment following the discovery that the Grenfell Tower was triggered by a fridge-freezer fault. The Royal Institute of British Architects has also issued its own guidance to UK architects, as well as to government. The body has called for an immediate review of the fire safety manual Approved Document B, as well as a review of the Building Bulletin 100 to consider whether sprinklers should be made mandatory in new schools.